On Saturday, May 23rd, TradeJustice activists participated in the 700-strong March Against Monsanto NYC to expose Monsanto's role in influcencing TPP and TTIP and how these agreements and Fast Track trade authority serve the company's interests at the expense of family farmers, consumers, bees, and entire ecoystems. 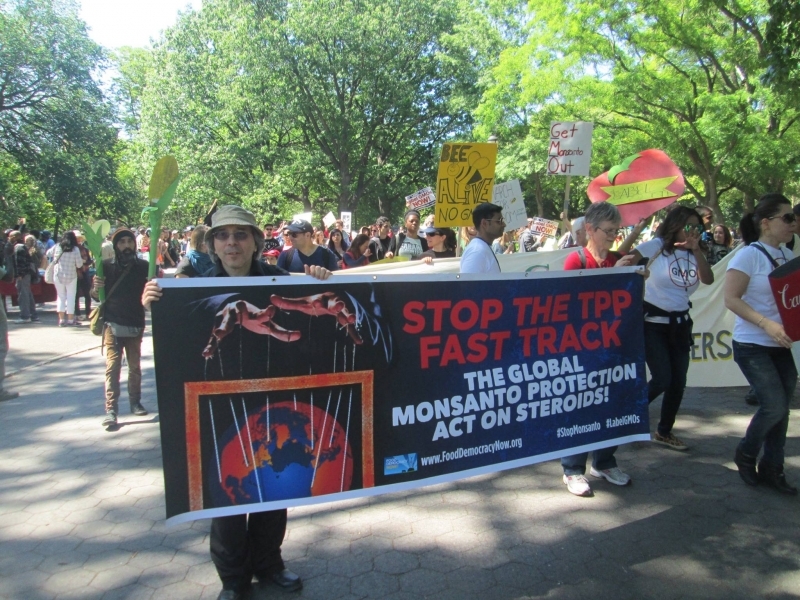 TJ activists led a TPP/TTIP focused contingent in the march using signs created by Michiko Takatani (MoveOn Queens Council) and Adam Weissman (Global Justice for Animals and the Environment) and banners generously donated by our friends at Food Democracy Now. At the rally following the march, Adam and Susan Metz (Park Slope Food Coop International Trade Education Squad) urged attendees to recognize the impending threat of Fast Track and to take action against it. Still later, Adam and Pete Dolack (Systemic Disorder gave a more in-depth presentation at the Monsanto Free School. TJ activists and allies also led the March Against Monsanto in Sparta, NJ and leafletted against TPP and TTIP at the Long Island March Against Monsanto. At these events, we premiered the new version of our flier on Monsanto, TPP, TTIP, and Fast Track. View photos from the march and free school. View videos from the March.